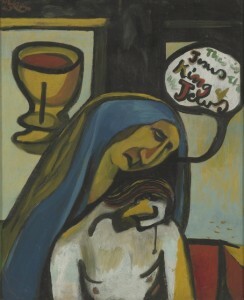 Te Papa has a strong collection of Colin McCahon’s early religious works, including three paintings from 1947 that depict events from story of the Passion: Christ taken from the cross, Entombment (after Titian), and King of the Jews. One of the enduring myths surrounding McCahon’s early paintings is that were rejected by critics. This is summed up in ARD Fairburn’s memorably dismissive line ‘They might pass as graffiti on the walls of some celestial lavatory’, which appeared in a review in Landfall in 1948. In fact Fairburn’s was something of an exception to the critical response that initially greeted these works. Like other reviews, Beaglehole’s sparked a flurry of letters to the editor, but for every writer attacking McCahon there seemed to be another willing to stand up in his defence. One such defender was Rita Angus, who described McCahon as ‘a courageous painter who renounces honestly what is not essential to him … a traditional painter in his way ’. ‘His raw crudity gives the same sledge-hammer force as the direct simplicity of the Biblical text,’ continued Simpson, adding that ‘McCahon is like a saltwater douche, disagreeable but good for health. His pictures in a living-room would be about as comfortable as a Bible class tea in the presence of the prophet Ezekiel.’ That was actually meant as a compliment. Glad you’re enjoying these works, Jennifer. Good luck with the essay. I have just been writing about this period and the 1948 reviews of McCahon’s work. I found it really intersting that McCahon and Angus were so mutually supportive considering their huge stylistic differences. Comparing their 1947/48 works side by side was an eye opener.